Pressure Cooker Shredded Sweet and Sour Chicken is the perfect easy dinner recipe for the entire family. You can also make it in the slow cooker. This easy sweet and sour make-over isn’t fried but everyone loves it just the same. I am super excited to share this recipe with you all today because it’s one I grew up eating. My mom made sweet and sour pork often when I was a kid and I always looked forward to that meal. Sweet and sour anything was my favorite Chinese food because of the sweetness and the yummy sauce. I wasn’t one for spicy back then, so I needed a bit of sweetness to get me on board. When I thought about making sweet and sour chicken, I had to ask my mom for her recipe. I was shocked that I didn’t have it – and that I’d never made it for Jordan. That girl LOVES Chinese food so I’m kicking myself this meal wasn’t in the rotation before now. Back in the 80s when my mom would make this recipe, she’d spend time cutting the pork into small pieces and dredge it in cornstarch and fry it before adding it to the sauce. Don’t get me wrong, I love me some fried food, but I do not love frying. It takes time and is messy, plus it adds extra calories we don’t need. I took her recipe and skipped the frying step: instead of fried cubes of pork I used boneless, skinless chicken breasts. Once they’re cooked they shred up easily and the shredded chicken in sweet and sour sauce is the perfect easy weeknight meal. Not only did I revamp her recipe to use shredded chicken, but I used my new Crock-Pot® Express Crock Multi-Cooker to cook the entire thing. Have you all jumped on the pressure cooker train yet? Maybe it’s because I’m a food blogger, but it feels like every recipe I see on Pinterest or Facebook are ones using this new (old) appliance. Even a few of my friends have started posting about pressure cooking on Facebook so I started to feel like I needed to get on-trend and I’m so glad I did. Since I started using my new pressure cooker I haven’t stopped! I’ve been using it almost daily since it came out of the box a few weeks ago. First of all, don’t be scared or worried about pressure cooking. Today’s electric pressure cookers are easy to use and totally safe. They’re as easy to use as a slow cooker and easier than cooking a meal on the stove. The Crock-Pot® Express Crock Multi-Cooker makes a variety of meals, fast! There are options for slow cooking, pressure cooking, steaming, and you can even sauté or brown meat. Thanks to the presets (like “poultry” or “soup” it’s effortless to create a variety of great tasting meals. Place meat in the insert. Add liquid (at least 1 cup). Press Poultry (or other meat) and hit start. After the machine heats up, it cooks for a pre-specified time (15 minutes for chicken). Once it’s done, the machine enters warm mode. Release the pressure and you have dinner – DONE! Pressure Cooker Shredded Sweet and Sour Chicken is an easy weeknight meal that the entire family loves! I am always worried about getting dinner on the table and this machine is helping immensely. I am notorious for forgetting to start a slow cooker in time, so having the pressure cooking option is perfect. Plus, there is no need to get more pans dirty. So many roast or soup recipes call for browning meat before slow cooking: you can do this right in the Crock-Pot® Express Crock Multi-Cooker. It makes making chili or pot roast easy! I absolutely love this shredded sweet and sour chicken recipe. To make the sauce, you whisk all the ingredients and pour it over the chicken breasts. Pressure cook it for 15 minutes and the chicken is done perfectly. Then remove the chicken to rest and shred it while you finish the sauce on the brown/sauté function. All you have to do is add some green bell pepper and onion and cornstarch to thicken it. You can even add chunks of pineapple if you want! Serve it over rice (which you can also make in your Crock-Pot® Express Crock Multi-Cooker) and you have a complete meal. Make sure you use at least one cup of liquid for the pressure to work. 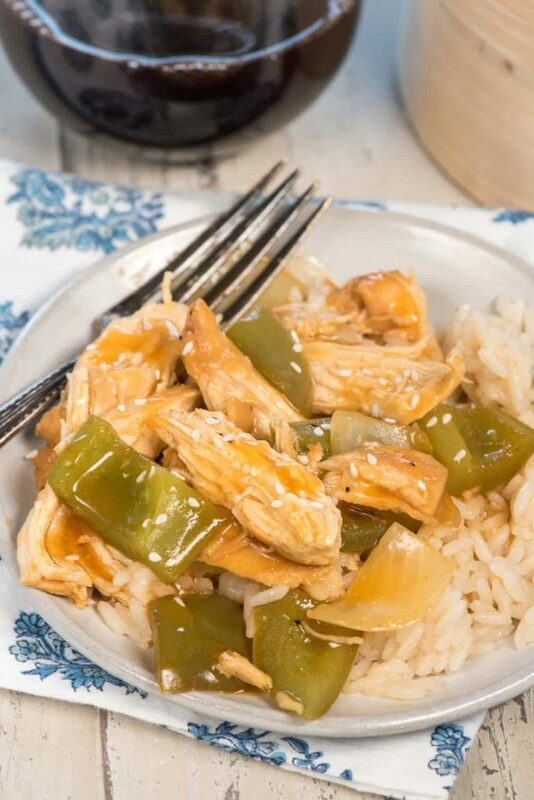 When you’re first starting out, read the directions and make something simple, like this shredded sweet and sour chicken recipe. I use quick release when I make this and other chicken recipes. Quick release is when you use a fork or other utensil to flip the pressure valve open after cooking to release all the steam at once. This is so the food doesn’t overcook as the pressure releases naturally. Some recipes require a natural or expedited natural release; refer to the recipe to see which one to do. Shredded sweet and sour chicken is an easy pressure cooker recipe. It's perfect for an easy dinner and even the kids love it! Place chicken breasts in the bottom of the Crock-Pot® Express Crock Multi-Cooker insert. Whisk together pineapple juice, ketchup, soy sauce, rice vinegar, honey and pepper. Pour over the chicken. Place the lid on the Crock-Pot® Express Crock Multi-Cooker and slide it into the lock position. Press the Poultry button and then Start. The pressure cooker will build pressure and heat for 10-15 minutes during the HEAt setting and then will turn to 15 minutes, the default poultry cooking time. Once the time has elapsed and the machine beeps to signal the end of cooking time, carefully use a fork or other kitchen utensil to flip the valve to open to quickly release the pressure. Be careful because the steam that rushes out will be very hot. Do not touch the valve or the steam with your hands. Once the steam has released, open the Crock-Pot® Express Crock Multi-Cooker lid by unlocking it. Remove the chicken to rest. 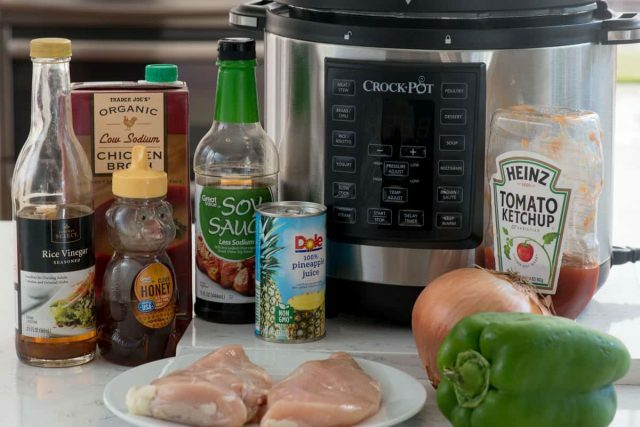 Meanwhile, turn the Crock-Pot® Express Crock Multi-Cooker to Saute and add the chopped pepper and onion. Bring to a boil. Meanwhile, shred or chop the chicken. Stir together the cornstarch and cold water, then add to the sauce. Stir and cook until it thickens. Add the chicken back into the sauce and cook for a few seconds to combine the flavors. Turn off the Crock-Pot® Express Crock Multi-Cooker. 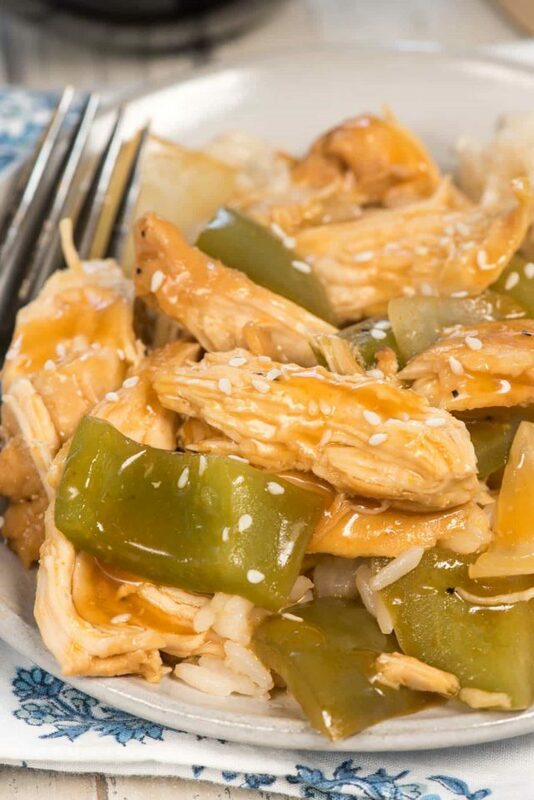 Serve the shredded sweet & sour chicken over rice. Serve hot and store leftovers in an airtight container for up to 2 days. Want to win your own Crock-Pot® Express Crock Multi-Cooker? Enter to win below! Full rules and regulations are in the rafflecopter widget. I’ve not yet tried this new pressure/crockpot but I am know as as the crockpot queen of my family because I cook so much in it. thanks for the chance to win! I have wanted one since so many people love theirs. This is at the top of my Christmas list. Easy, delicious and a family favorite! Thanks for this recipe, it’s a weeknight staple now! I would love to make sweet and sour chicken this quickly. Amazing, easy recipe! Made this last night, with added pineapple chunks and green and red peppers, it turned out great. Chicken was super tender from the poultry setting on the Instant Pot, my first time using that setting. Thank you, this will be on my regular dinner recipes. Your recipe looks delicious, and makes good use of the new Crock Pot Express Crock Multi Cooker. 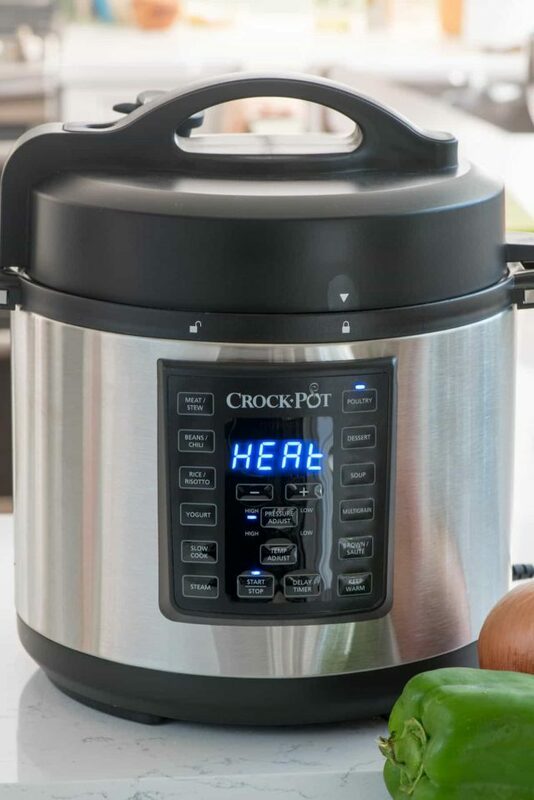 I was glad to see Crock Pot brought such a worthy entry to the electric pressure cooker market, one with a lot of really nice features and, of course, the reliability of the Crock Pot brand. Thanks for this chance! This is amazing! I would love one to make Slow Cooker Pumpkin Swirl Cheesecake Bars. What a nice recipe to try! Thank you for sharing!! Can’t wait to try it this weekend. Does it matter if you use frozen chicken vs. Thawed? This was a great recipe! Made this as my first full meal in my pressure cooker, and it did not disappoint. Chicken was tender but still solid, not shredded, which I was really happy about. Whole family said it’s a make again. Thanks! Is there a way to adjust the sodium content? My mother is on a low-sodium diet.